Later today, we head off to Boston for the National Writing Project’s Urban Sites Conference. This will be my first USC and I am pretty excited to listen to Ernest Morrell as the keynote tomorrow and to tap into the expertise of teachers who work in different settings than I do. The conference title is Nurturing Student Writing: Navigating Literacies. Much of the focus of the sessions is around use of media and culture as a way to inform learning and to tap into the expertise of our students. So, while the focus may be on how to engage urban learners as writers and composers, there should be plenty of great ideas in any school. Creating spaces for urban student voices means finding ways to make writing relevant, engaging, and accessible. Participants will engage in writing with social justice at the core, explore student writing/digital media products, examine resources for supporting students’ digital learning, and brainstorm applications for their own classrooms and contexts. Each weekend, over at our iAnthology network for National Writing Project teachers, Bonnie or I or a volunteer post a writing prompt. It’s always sort of a challenge to find an idea that will engage as many of the close to 400 members as possible (on average, about two dozen folks will contribute to a prompt each week). Yesterday morning, I was trying to come up with an idea when I got a link shared to me by Ira Socol, who was responding to my post about 25 word stories. I loved the poems he shared, which are structured poems. I didn’t see a name of the style, so I called it X by X (X being the number of lines and then X being the number of words per line). The response has been pretty wonderful, and I have been using Cinch to record audio responses to everyone’s poems, giving some voice to my reactions to their writing. I love the simplicity of Cinch and how easy it is to embed into our site. And since it a site where geographic distance is everything, having a voice connected to your writing gives it a certain power of response, I think. on the floor, with my youngest. when what I desire is peace. what is my favorite and magical number. of fortune and mystical numbers of chance. I expect the next question: “Why seven? but it never comes; only quiet munching. PS – If you are a Writing Project teacher looking for a supportive space for writing, drop me a comment and I will invite you into the iAnthology network. Dale Doughtery, of Make Magazine, wrote a nice piece about the National Writing Project’s Make session that took place at the NWP Annual Meeting. I was one of the presenters, doing a bit on stopmotion animation. The session represented an ongoing relationship between NWP and Make Magazine around informational, expository writing. When I began talking with folks from the National Writing Project last year, we hit on the idea that getting teachers to see themselves as makers was a great way to encourage making in schools. Thus, the goal of this workshop was to provide a gentle introduction to making for about 50 teachers. There were about eight stations with a variety of projects. Without too much in the way of preliminaries, the teachers sat down and started making. They talked to each other while working (or playing, as I might prefer to call it) and they helped each other. The projects were not simple but they were fun. The teachers were making drawbots and brushbots, flickering mood lights, stop-frame animation, bottlecap jewelry, and bracelets that functioned as snap-circuits. Read the rest of Dale’s article entitled “Teachers as Makers: Educators Discovery How Hands-on Learning Can Help Writing” over at O’Reilly Radar. PS — this is what the teachers at my Make table made in our hour of play. A month or so ago, I was one of a handful of guests (including Suzie Boss) on Teachers Teaching Teachers, where we discussed how to tap into current events and unfolding news for learning in the classroom. While our main focus was the Voices on the Gulf site (which is up for an Edublog award for best use of a social network in education — vote for us! ), the conversation was pretty wide-ranging. When the Deepwater Horizon oil well exploded in the Gulf of Mexico earlier this year, teachers across the country recognized an opportunity to bring real-world applications of math and science into their classrooms. Similarly, the rescue of 33 Chilean miners has triggered student discussions about everything from heroism to human biology. In the wake of such dramatic events, some teachers are eager to do more than host current-events-style conversations. They want to use the news as a launching pad for in-depth student learning. But making that happen requires teachers and students to dive into topics for which there are no texts or guidebooks. What’s more, maintaining student interest can be challenging once the headlines start to fade and media attention shifts to tomorrow’s hot topic. How do you plan for academically rigorous projects that are “ripped from the headlines”? Here are a few suggestions, along with some timely resources. Thanks again to Paul Allison and Susan Ettenheim for hosting the TTT show each week at EdTechTalk. Yesterday, many of us in the National Writing Project were keeping careful tabs (no doubt, peeping into the news during the day) to follow the fate of a US Senator proposal to eliminate “earmarks” in the federal budget. The amendment by Sen. Coburn would have effectively gutted the NWP and some other educational groups whose federal funding support are considered “earmarks” attached to the federal budget. The Coburn proposal would have instituted a three year moratorium on any earmarks. The amendment did not pass muster (see the short piece in Slate). The vote tally was 39-56, with 67 needed for passage. But my guess is that earmarks are an endangered species in DC because, although they represent only a small portion of the budget, they are huge with political symbolism of waste and fiscal irresponsibility. How it is that NWP funding got lumped into the earmarks is something I am not privvy to nor do I really know much about the political workings of the NWP at that level. But I think a huge push has to be made to shift NWP, Reading is Fundamental and other educational organizations out of that earmarks category, if possible. In fact, it makes me uneasy, knowing that NWP is lumped in there. If the public sees earmarks as wasteful spending, how will they view the NWP as part of that? Check out this interactive map for how earmarks are played out across the country, and it is so clear that our politicians (yep, mine, too) use the earmark process for financial gifts to their districts. Here in Massachusetts, in fiscal year 2010, we had $176,803,000 in earmarked funds. I am sure much of those funds were put to good use (bike trails, roadway improvements, etc. ), but it seems like there needs to be a better mechanism than jamming funding for projects onto whatever bill is before you (such as the Coburn Amendement itself, which was attached to a Food Safety Bill). Is it good or bad that the moratorium was not enacted? I suppose that is for each of us voters to decide, but the push now from the Republican Senate leadership is to kill earmarks, and my guess is that this may gain momentum in the next two years. When I think of “earmarks,” I think of fluff — of bridges to nowhere and multimillion dollar research centers that have absurd missions, of things that don’t necessarily impact my life. When first started to hear about the push to end earmarks, I figured: I can live with that. It might mean one less terminal, or one less mile of bike trails, or one less repaved roadway, but I can live with it in this age of austerity. I should know better, of course, being the old newspaper reporter and political junkie that I was. I’m a beneficiary of earmarks in a way that I never really thought about. It turns out that my National Writing Project, as well as number of other important educational programs (RIFF, etc.) are also earmarks in the federal budget. Which means that the vote on Monday in the United States Senate on a proposal by Sen. Tom Coburn (R-OK) to completely eliminate earmarks for this current budget year, and the next few years, could completely financially dismantle the National Writing Project, which relies heavily on federal funding to provide crucial and important professional development for tens of thousands of teachers, and teacher-leaders, in the country across all grade levels. So, I’ve been on the phone, calling my senators (Kerry and Brown) to urge them to reject the Coburn Amendment, and contacting fellow Western Massachusetts Writing Project folks, urging them to do the same. And you, too, please, if you are in the NWP network or have benefitted from NWP or if you care about education. Please pick up the phone and show your support. About a year and a half ago, I went out to California for a meeting about a National Writing Project venture that was be entitled Digital Is. Supported in part by the MacArthur Foundation, the Digital Is concept involved a web portal to explorations of technology, writing and learning in ways that would go beyond the “how to do it” of typical websites. Yesterday, the NPW Digital Is site launched to the public, and it is a wonderfully rich potpourri of teacher reflections on the “why” of technology as much as the “what we did” of technology. There are plenty of examples of student work, too, and discussions will hopefully revolve around our changing ideas of what writing means when it comes to multimodal composition and the classroom. … there’s no mistaking the impact of both the development of new digital tools for composing and of the internet as a global communications and collaboration space. What it means to write, to research, to publish, and to work together has changed dramatically in the last few decades. As educators, we know our teaching must change too. As a start, I want to point to a few “collections,” which are curated resources that are constructed around themes. This idea of collections is a great idea, as it pulls together projects and frames them in an importance concept or question by the curator. 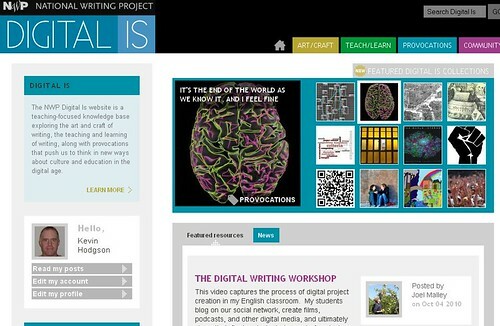 The site is designed to keep growing and you don’t need to be part of the National Writing Project, either. I encourage you to take a tour of Digital Is, become a member and join the conversations around what writing and composition looks like in this midst of technological change, and where our teaching might be going in the years ahead. I’ve been invited to be a presenter at what could be a very interesting session at the National Writing Project‘s Annual Meeting in November down in Orlando. NWP is teaming up with MAKE Magazine to offer a session on technical writing and Do-It-Yourself exploration. A special Saturday event hosted by the NWP Digital Is project’s partnership with Make magazine. Participants will be invited to explore the connections between making and technical writing through hands-on projects and shared reflection. Come to learn about the making/crafting/tinkering/DIY movement and explore connections to your own practice. I’ve been asked to do a one-hour session on stopmotion moviemaking. After my small group makes their movie, their task is going to be to document what we did in technical, expository writing. So, they experience it and then explain it for others. Yesterday, I used some wiki stix (actually, they were knock-off stix and were a pain to use — note to self for workshop: get the real ones) and made a prototype movie that also became a teaser of sorts for the NWP Makes! session. I was trying to make the dude talk (I used Audacity to change my voice) and that is hard to do, I found out! Right now, I am trying to come with “story” scenarios for 10 people to make a movie around in an hour. An hour is not long when you are shooting frame by frame. I have some ideas, though. PS — If you are interested in stopmotion animation, I created a website with hints for teachers and students. Go to Making Stopmotion Movies. I guess I wasn’t expecting too much from my Senator when I sent him a letter to please lobby on my behalf for continued federal funding for the National Writing Project. Right now, there is no direct funding for NWP in President Obama’s educational plan (see more details). I know Sen. Scott Brown is a Republican still trying to find his political footing in Washington, but I still hope he heeds the call of us Massachusetts teacher and constituents when it comes to the importance we place on the National Writing Project in terms of professional development and impact on the classroom. I am hopeful that he heard my points. This is a great video encouraged to spark your interest in the Summer Institute of sites in the National Writing Project.